Amidst a number of weddings happening every day across the world, social media witnesses most of them. Instagram, being a popular platform that shares inspirational ideas is full of wedding pictures. But with this abundance of images, how do you find the one you need? The solution is simple – Hashtags! Along with some common hashtags used by people for their weddings, you can make a unique, exclusive hashtag just for your D-Day. Wedding photographers gain rapid followers if they use the right hashtag for it. Along with tips to make your own, here are some of the common top wedding hashtags to show off your wedding day. Probably the simplest and obvious hashtag. This is used across platforms apart from Instagram such as Facebook, Pinterest, and Twitter. 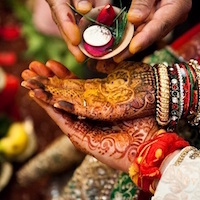 This makes it a broad category, covering everything from individual couples’ wedding photos, engagement photos, pre-wedding photos and photos from other functions like sangeet, mehendi and more. As the hashtag suggests, you’ll find all the fun activities under this! This hashtag has a collection of funny faces, funny poses and exhilarating moments from the days of the events. Among one of the most used, top wedding hashtags, this is all about the actual day of the wedding. This does not have the pictures of any pre-wedding related function or preparations for the wedding. It’s about the big day and nothing else comes under it. This hashtag is sure to have the sweetest and the most enchanting pictures. When a bride is searching for inspiration for her wedding day, this is probably the first hashtag she’ll look into. Let the world see your wedding and get ideas for their own! This is also a way for photographers to advertise themselves that may let the bride or groom consider to hire them. This hashtag is your click if you want to look for inspirational ideas for your wedding dress, or simply show off your beautiful outfit. Blushing brides and their mesmerising dresses are all you see here. The decoration for a wedding is essential for welcoming your guests to your enchanting, fairytale wedding. Use this hashtag you let the world know how beautiful your dream wedding was! This is the top preference for a hashtag if you’re going around the globe to get married. Or even if it’s somewhere you both have always wanted to go, this hashtag is all about that. 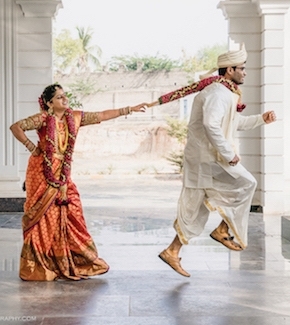 And of course, the most trending Big Fat Indian Wedding hashtag is this. You should definitely have your wedding pictures under this category! This is all about the woman whose day it is. This hashtag has the most beautiful brides preparing for it or on the happiest day of their lives. 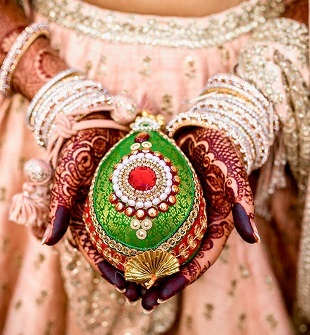 Also, for bridal outfit inspiration ideas, this is your click. The happiest faces celebrating the day they get hitched is the most innocent and blissful sight and Instagram’s this hashtag has them all! For photographers to advertise their work and let people take inspiration, there are a lot of hashtags they can use. Professionals should make sure they change the hashtags they use since Instagram may decide to stop showing your pictures in tags that are used too frequently. If the photographers have a set of tags saved in the clipboard, they should ensure that the spelling is precise so they show up in the trending category and not in a separate incorrectly spelt one. Below are some categories to keep in mind while posting hashtags. You can also tag different pages that give shoutouts to photographers or promote their work to get noticed. The wedding being Indian should let the world know about it in it’s own category. The categories of the pictures come here, whether it is the picture of the bride or groom or the place of the wedding and more.Below is a list of some of the top wedding hashtags to show off your photography skills. After getting engaged, couples start brainstorming about an innovative hashtag to let their wedding day stand out on the social media platforms. It gets tedious to come up with something out of the box and people sometimes run out of ideas. So here are some tips to make your own trending hashtags. The first and basic attempt is to see if you and your partner’s name together isn’t an existing hashtag. If #PriyaSahil or #SahilPriya isn’t available on Instagram already, you’re good to go! Start letting the world know about your wedding in advance. Adding the year of the wedding in the hashtag along with a short form of the combined names of a couple can make a quirky, unique hashtag for their D-Day. #MahiLa2016, where “Mahi” stands for the girl Mahima and Lavik for the guy with the year they got married. If your hashtag has a pun, it’ll be funny and memorable. Like the actor Arunoday Singh and Elton Lee’s wedding hashtag #DayLee went viral for being cute and funny. You can also go for making your hashtag based on the theme of your wedding. Bipasha Basu and Karan Singh Grover wedding sprouted the hashtag #MonkeyWedding to keep pictures in one place. ‘Monkey’ being the theme of the wedding was spotted in places such as bridesmaids’ gifts and the wedding cake. Hashtags like #TheBeachDayWedding amongst many can be used for destination weddings. Get a unique hashtag by using some hinglish and making it meaningful. Adding “ki shaadi” or “ka Byaah” after the initials of the couple can make it interesting. Let your guests remember a memorable phrase and show your wedding from their viewpoints on Instagram. The hashtag #ShonDesh, which also refers to a Bengali sweet was created by a couple that used “Shon” from the bride’s first name Shonan and “Desh” from the groom’s first name, Aadesh. Is it creative, or is it creative? #WattaWow. Voila! Once your unique hashtag is prepared, get started by letting your guests know about it and have the pictures of your wedding all in one place. Let us know of more hashtags in the comment section which we can add to the list of the top wedding hashtags.